Nobel laureate, Prof. Wole Soyinka shocked a lot of Nigerians when he endorsed Prof. Kingsley Moghalu, candidate of the Young Progressive Party (YPP), for President. Soyinka and his civil society group, Citizens Forum, made the announcement in a statement he personally signed, where he outlined circumstances leading up to the decision which he described as rigorous. Soyinka said he came back from the rumination on who would best do the job of leading Nigeria best before returning a verdict that it was Moghalu that he settled for. The statement read, “The nation has been brought to her knees. Internally, the blaring media testimony needs no augmentation. Beyond her borders, Nigeria is the tale of citizens designated pariahs of the global community for whom special dossiers are opened, and units of security agencies are specifically assigned. Online transactions are programmed to reject basic usage once the word ‘Nigeria’ is inserted in the Data profile. There are few nation left, within or outside the continental borders where – no matter the codeword – a Nigerian ‘room’ has not been designated. “Her humanity litters the sand trails of the Sahara, it lines the Mediterranean sea-bed with the bones of a desperate generation, seeking ‘green pastures’. Lines from my poems have been appropriated and embossed as epitaphs on the tombstones of Nigerians washed up the isle of Catania and accorded dignified burials by total strangers, certainly paid more respect than Nigerians themselves consider due to their own humanity. Other would-be migrants have been slaughtered by religious fundamentalists on the shores of Tripoli, while waiting for their precarious crossing on suicidal boats. Yet others end up as commodities in the slave markets of Libya and Mauritania, hundreds recently rescued and airlifted – credit where credit is due! – repatriated by government. 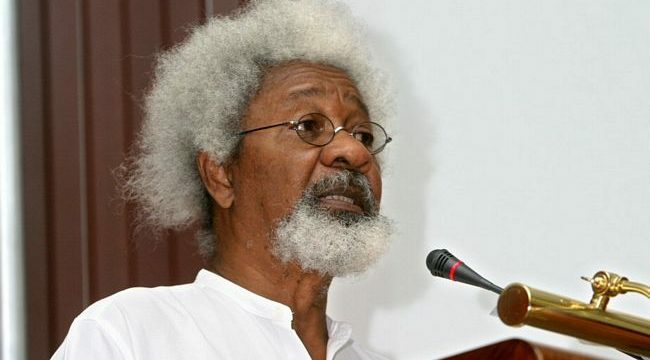 Soyinka said his civil society group did not need any instruction to estimate that several of the aspiring groups were mere plants, raised to sow confusion. He said: ‘It redounds to the credit of a few individuals, including some of the candidates themselves, who embarked on efforts to winnow down their own ranks, then seek a consensus candidate as standard bearer for the battle against the two political behemoths. “They did not succeed, but that is no cause for despair. They still deserve the gratitude of Nigerians for their uniquely principled efforts. The Citizen Forum – last heard of during the time of the dictator, Sani Abacha – was pulled out of retirement to join in their effort to arrive at peer consensus. The Forum worked peripherally with them. It made no attempt – I stress this – no attempt whatsoever to impose its own preferences, but utilised material from the deliberations of at least four such selection groups. It remained on the fringe, except on invitation. Soyinka continued: “ I physically interacted with some of the acknowledged top contenders, in some cases several times. We participated in handshake across Nigeria, where some candidates presented their briefs. “There was nothing complicated about assessment parameters: mental preparedness, analytical aptitude, response to the nation’s security challenges, economic grounding, grasp of socio-political actualities, including a remedial concern with the Nigerian image in foreign perception etc. etc. not forgetting a convincing commitment to governance and resource decentralization – commonly referred to as Restructuring. The Forum rejected retrograde propositions of a political merry-go-round, which urge the electorate to choose this or that candidate in order to ensure “our turn” at the next power incumbency. Overall, the exercise was exacting but also – therapeutic. It proved yet again that there is over-abundant leadership quality locked up in the nation, and that it is a collective shortcoming that the political space has not been sufficiently opened up to let soar such potential. Well, to cite the Chinese proverb: a journey of a thousand miles begins with the first step. “Let me reiterate: there is over-abundant, but stifled leadership material, and there can be no excuse, now that that potential of high quality is being manifested, for constricting the political space in a population that is nudging two hundred million. And that statement is of course specially addressed to those who took part in this exercise, those who deliberately opted out of it, some of whom were assessed anyway. Such potential compelled us to exercise utmost rigour in what proved to be a most daunting exercise. The final determination however is – the flag-bearer of the Young Progressive Party – Kingsley Moghalu.